This is the moment I have been training for all year. Well, one of the moments. IRONMAN Miami. The moment where I would add 70.3 miles to my list of distances I have accomplished. As the moments got closer, I got nervous and excited. That morning, with everything ready to go, it was now or never. That weekend was surreal. I had worked IRONMAN events, had friends complete them, but now it was my turn. I arrived at the village Friday afternoon to pick up my race day packet, do some shopping and, of course, get my staff discount! I got to see some Ops guys I worked with in Placid and wander around, looking at the venue and parts of the course. Saturday I came back down with bike in hand and racked it at 12 when transition opened. I then went to the stage and listened during the athlete briefing then went on my merry way to eat, rest and watch the Miami football game. That night I ate my traditional meal of sushi and shrimp fried rice. I guess the sushi was too raw because I got sick that night (of course) and woke up with my stomach empty, no Bueno. So I ate a Clif bar and some chomps and hoped that would be enough until I got onto the bike. That morning the winds were calm as were the bay and the temperature was 78.5 degrees, non-wetsuit legal. I was in wave 4 that went off at 7:35, which was perfect as I got to finish the bike before it got too hot. We jumped off the dock, waited 2 minutes and were off. The waters were lovely, not clear but comfortable. I wasn’t in any rush, I was taking my time. 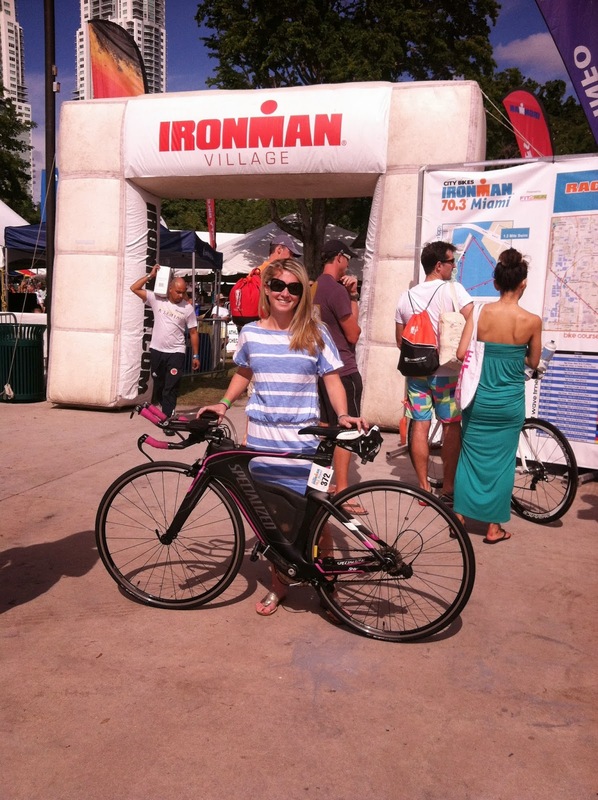 This was, after all, my first Half Ironman so I cared more about finishing. The swim took us in a triangle shape, through some seaweed (not enjoyable) and past some boats. Apparently some dolphins came and swam through the middle, I didn’t see but my mom did. I got out of the water, ran to transition and got ready for the next leg of 56 miles. I was lucky because my bike was parked right next to the inflatable IRONMAN Perform so I could find it very easily. I took my time but also hurried. Bib was required for this part of the race. The bike took us out and back past the airport then out some highway I have no idea what it was. It was flat and fast, except for the headwind out. Thankfully we had a tailwind on the way back and our own lane for each way. 3 aid stations with some very enthusiastic kids ready and waiting to hand us our water and perform. It got a little congested at times, but that just made me work harder. The transition was long as it typically is in IRONMAN events, but I was more worried about jello legs, which I did not get thankfully. I shuffled my way towards my spot in transition, put on my compression calf sleeves, visor, two gels and off I went. Longest run of my life and a hot one indeed. The run course was two loops and consisted of running over a bridge 4 times. There wasn’t a lot of people out cheering us on, but the aid station kids were very entertaining once again. I started to feel like I needed more electrolytes in me because on the bike my stomach wasn’t able to handle everything going in so I had to space it out more so than I wanted. So at the aid stations I grabbed two cups of Perform and drank it up. On the way out for my second loop I started to feel tired (maybe? not sure) so I took in more Perform and water. Coming down the finish line, I really did not have it in me to sprint it out, I just wanted to enjoy the moment and experience it. My total time was 5:56:17 which was under my goal time of finishing in 6 hours and MAN was I happy to be done running in that heat. This was an incredible experience, I didn’t really hit me until the next day what I did but still, I have fallen in love with a new distance. 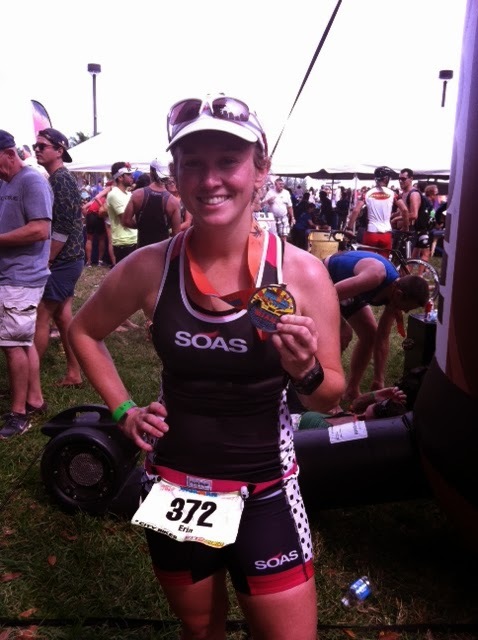 I am still in awe that I just raced and completed 70.3 miles but more so happy with myself. This has been a tough and stressful year and not what I expected it to be. I am just so happy that I have accomplished everything I have and I look forward to my offseason where I can just enjoy working out. Thank you to everyone who has helped me along this year. I couldn’t have done it without you. Ehh… Not a Fan: Bike course was blah, layout of the venue, bike check out was not available until all bikes back, aid stations running out of cups.